A Christmas Story! I watch it every Christmas (way too many times). My family always sent out traditional cards... no embarrassing photos to share but here's my first Christmas in '86. 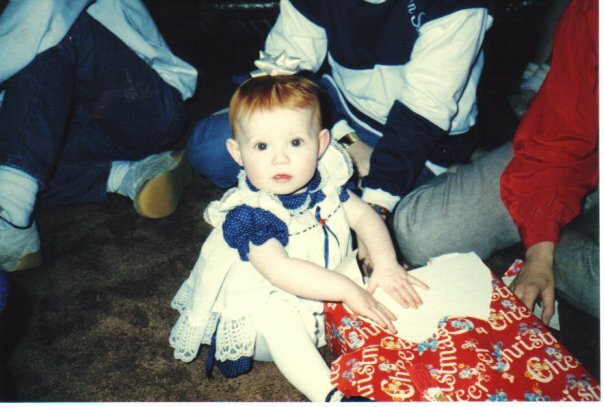 As you can see, I'm a natural redhead and thankfully my ears don't stick out like that anymore. Yes, quite a few (it feels like the majority but I'm not sure). It doesn't feel like Christmas without at least some snow on the ground. I don't understand how people who live in warm, sunny climates can fully get into the holiday spirit. 5. Where do you usually spend your holiday? Play! I'll sing along when no one is around or if I've had a few... not a gifted singer to say the least. We have family and friends over each year, so I open the presents that they bring. In the past, I may have opened one from my parents or taken a peek inside my stocking but for the most part, I wait until Christmas Day. I get my shopping done pretty early, so I'm always anxious to give my gifts! Dasher, Dancer, Prancer, Comet, Cupid, Donner, Blitzen & Rudolph?... looks like I forgot Vixen. 9. What holiday tradition are you looking forward to most this year? I love to give presents. I'm excited to see what my sister thinks of one of the things I made for her. 10. Is your Christmas tree real or fake? We have two artificial trees. It's not the real deal but it's so much easier and that's two more trees left to keep the area beautiful. 11. Hands down, what's your all-time favorite holiday food and holiday sweet treat? 12. Be Honest: do you like giving gifts or receiving gifts better? When I was little, of course I loved to get presents on Christmas but as I've gotten older, I much prefer to give gifts. It's awkward to receive a present and feign interest if you don't care for it. I don't want to hurt anyone's feelings... not a fun position to be in. I'm not the easiest person in the world to buy for because I have really specific tastes. I LOVE to give presents because I can be creative. I consider myself an excellent judge of character and a good listener. I'm also pretty generous. So, I've been told I give thoughtful, useful and memorable presents. Home is where the heart is but anywhere in the mountains with lots of snow would be nice... Aspen or Vermont, perhaps. Not unless the recipe pertains to alcohol. 16. Are you a pro-present wrapper, or do you fail miserably? I've always been on the artistic side (drawing, designing, etc.) but when it comes to wrapping presents... failure. I think I get too excited to have it look nice that I rush through it. Gift bags are my friends but I still like to wrap what's inside for an added touch of fun. 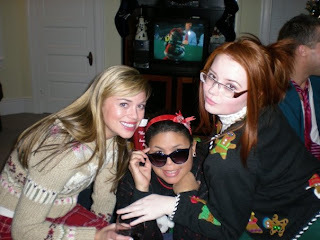 Having really special Christmas Eve parties each year that would go pretty late. My parents are very hospitable and down to Earth, so people would come at all hours. Plenty of laughter, drinks, music, food... nice memories. 19. Do you make New Years Resolutions? Do you stick to them? Yes. I try to choose things that I can gradually improve upon... some more successful than others. Where I live, the weather shifts right as the holiday season starts to begin. The colder air comes through, snow starts, extra traffic... it just feels different around Christmas time. What makes it special is the atmosphere it brings. Showing love and appreciation for friends, family and the year as a whole is always wonderful. I love feeling like a child again.